Welcome to Chiang Mai. Arrival at Chiang Mai airport before noon. Your guide and driver will welcome you. They will take you for a typical Northern style lunch. The best of Chiang Mai Package will start with a visit to Wat Prathat Doi Suthep, a must-see attraction of the city. After lunch you will visit Wat Phra That Doi Suthep, a beautiful temple from which you have a fantastic view over the city. Your guide will tell you about the history of the temple and about Kruba Srivichai, the monk whose followers constructed to the road to the temple. The road was finished in 1935. Return to your hotel in the late afternoon after an unforgettable Chiang Mai highlight tour. On the way down we will stop at the small forest temple Wat Palan that sees few visitors. We will drop you off at your hotel. Your guide and driver will meet you at the hotel for your Chiang Mai highlights tour. We will show you the best of Chiang Mai. We will drive to the Ping River which was the an important transportation route before the railroad from Bangkok reached Chiang Mai in 1922. We will cross the famous Iron Bridge where we will stop briefly. 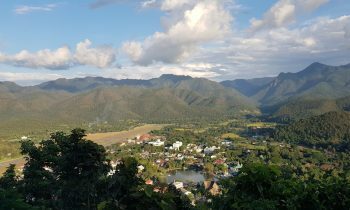 From here we will walk along the Ping River to one of Chiang Mai’s oldest hotels and the first Christian Church of the city, founded in 1868. We will visit Wat Ket, a temple that houses a remarkable small museum with lots of historical photos of Chiang Mai and interesting artefacts. We cross the Chansom Memorial Bridge to the most famous markets of Chiang Mai, the adjoining Warorot and Ton Lamyai markets. Your guide will take you around and will let you taste some of the typical Northern Thai delicacies for sale here. Close to the markets is a Chinese temple that we will visit. By now it is time for lunch. We will take you to a riverside restaurant where you will enjoy a delicious Thai lunch. After lunch we will drive through Thapae Road to Thapae Gate where we will enter the Old City. Here we will visit the spectacular Wat Chedi Luang. The temple dates back to the 14th century. It’s chedi, or stupa, collapsed in 1545. For more than 400 years it remained in ruined state until it was reconstructed in the 1990’s. Wat Phra Singh is our next stop. It is one of most revered temples in North Thailand. You can meet a Buddhist monk, if you wish. Your Best of Chiang Mai Package continues today with a lovely elephant experience. Your guide will pick you up from the hotel 0745. Drive to the Thai Elephant Care Center. After arrival you will get a briefing about Asian elephants. You will also get safety instructions. Although in captivity elephants are still wild animals and you have to be careful in their presence. You will change into a traditional Thai farmers tunic which is very comfortable. Then you will meet our elderly elephants and get close to them. You will learn to make grinded grass which you will later feed to the elephants. 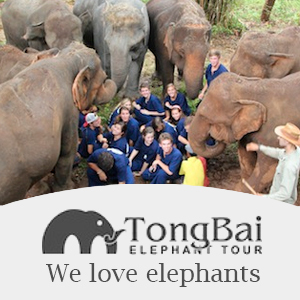 You will also visit the elephant cemetery and the place where the elephants rest at night time. Elephants love herb balls and you will learn how to make them. Feed them to the elephants which is really great fun. Then you will bathe with an elephant. Elephants love to bathe and it is a lot of fun to share this with an elephant. Feed bananas to our elephants. Say farewell to your elephant friends. Have lunch in a local restaurant. Return to Chiang Mai. The afternoon is free. Within walking distance are the Tonlamyai and Warorot Markets, the two most interesting and colourful markets of Chiang Mai. At 1900 your guide will meet you at the hotel and transfer you to Thapae Gate where your samlors are waiting for you to take you on Your drivers will wait for you. Get into your samlor for a nice and relaxing ride through Chiang Mai’s backstreet in the coolness of the early evening. We make our way through small alleys to Wat Laam Chang, the “Elephant Stable Temple”. This is the place where centuries ago the Royal Elephants were kept. Wat Laam Chang has a very old and attractive brick chedi. We continue to Wat Chiang Man. The ride is cool and pleasant. Chiang Mai looks very different after dark. Traffic is less than during daytime. Both Wat Laam Chang and Wat Chiang Man are not illuminated at night but are still great to visit. We head for Wat Phra Singh. This is probably Chiang Mai’s most revered temple. Wat Phra Singh currently houses Phra Chao Thong Tip, the most venerated Buddha statue in northern Thailand. Wat Phra Singh is beautiful after dark. We spend some time here. From Wat Phra Sing we make our way to Wat Chedi Luang. This is probably Chiang Mai’s most visited temple with its imposing characteristic chedi. An earthquake in 1545 damaged the chedi. The temple complex is illuminated. Next door to Wat Chedi Luang is Wat Phantao where we stop briefly. We pass Wat Intakin and the Three Kings Monument. We continue to Thapae Gate and head for the Warorot Market. Here we walk along the flower market. Continue to the Night Bazar where this tour will end. We will drop you off at a place of your choosing at around 2100. This is the end of your Explore Chiang Mai after Dark tour by samlor. Say goodbye to your drivers and enjoy wandering around the Night Bazar on your own. Transfer back to the hotel on own. Overnight at Ban Thai Village. Three breakfasts in the hotel.